As expected and as had been widely leaked, the IPCC 5th Assessment WG1 Report released last week presented a range of evidence that further underpinned the case for anthropogenic induced warming of the climate system. By contrast with the 4th Assessment Report issued in 2007, the chance of a human link shifted from likely to extremely likely. Pages of supporting evidence were presented. Based on current understanding of climate-carbon cycle feedback, model studies suggest that to stabilise at 450 ppm carbon dioxide could require that cumulative emissions over the 21st century be reduced from an average of approximately 670 GtC to approximately 490 GtC. Cumulative total emissions of CO2 and global mean surface temperature response are approximately linearly related (see Figure SPM.10). Any given level of warming is associated with a range of cumulative CO2 emissions, and therefore, e.g., higher emissions in earlier decades imply lower emissions later. 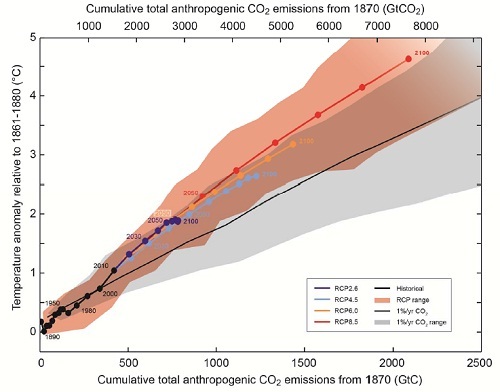 Limiting the warming caused by anthropogenic CO2 emissions alone with a probability of >33%, >50%, and >66% to less than 2°C since the period 1861–188022, will require cumulative CO2 emissions from all anthropogenic sources to stay between 0 and about 1560 GtC, 0 and about 1210 GtC, and 0 and about 1000 GtC since that period respectively. These upper amounts are reduced to about 880 GtC, 840 GtC, and 800 GtC respectively, when accounting for non-CO2 forcings as in RCP2.6. An amount of 531 [446 to 616] GtC, was already emitted by 2011. A lower warming target, or a higher likelihood of remaining below a specific warming target, will require lower cumulative CO2 emissions. Accounting for warming effects of increases in non-CO2 greenhouse gases, reductions in aerosols, or the release of greenhouse gases from permafrost will also lower the cumulative CO2 emissions for a specific warming target. The report also featured the chart below. This is important in that it clearly introduces into the mainstream the notion that the atmospheric CO2 issue is a stock problem, which brings with it a number of implications for both the energy system and the solution set. For the energy system, the key issue this raises is that the amount of carbon already in the pipeline for consumption is considerably more than the remaining stock equating to a 2°C temperature anomaly goal. This has been picked up by a variety of organizations, both NGO and financial, and is at the core of the recent discussions on a “carbon bubble”. But it also points to a critical aspect of finding a solution to the CO2 problem, the use of carbon capture and storage (CCS). I have written a great deal about this in previous postings. Sequestration (or removal of atmospheric carbon) is the only reliable mechanism for managing the stock, which means either increasing the permanent bio stock of carbon through forestry and land use or capturing and storing carbon dioxide geologically (CCS). Unfortunately this doesn’t get much of a mention from the carbon bubble proponents, which is a clear shortfall in their analysis. With the mitigation report coming out from the IPCC in the first half of next year, this WG1 finding may be an important placeholder for a more substantial discussion around sequestration. One area that is left unaddressed, at least for me, is a better discussion on the role of short lived climate pollutants (SLCP) such as methane, particularly in the context of a stock framework for thinking about the climate issue. Although the IPCC say that the effective stock of CO2 must be reduced to account for the warming impact of SLCP, this isn’t the whole story. The difficulty is that while anthropogenic CO2 stays in the atmosphere for a very long time, gases such as methane do not – they break down to CO2. This means that methane isn’t a stock issue, but a flow issue, i.e. the impact of methane released today is to change the rate of current warming, but not really the peak warming that we will likely see at some point late this century or early next century. Methane emissions at that time will impact peak warming. It also means that the current efforts to reduce methane now could be undermined unless CO2 is also reduced. So that is my take on this first release of the 5th Assessment Report. Of course there is a wealth of data to work through and understand, but this critical concept of cumulative carbon is one that needs to filter through policy circles. Once the penny drops on this story, we might actually see some real progress in policy making that will make a difference. The author says he has *written* a lot about CCS. Hmmm. So is it science fiction? Does CCS exist – I mean really. I mean I know I can light a bunsen burner in a chemistry lab and burn some gas and collect the gas products when cool and then convert the CO2 back into – well back into almost anything i like with a sufficiently big chemistry set and lots of flasks and energy and processes and chemicals and time. Might even be able to turn it back into methane. In a similar way as its probably possible to collect the bye-product of drinking 12 cups of coffee, and reprocess the waste stream (wee) back into coffee. So I don’t doubt that anything is possible. I’d just like to see for myself, a coal power station, with 100 rail trucks a day of coal arriving in one end and 100 rail trucks a day of pure solid carbon leaving in an orderly fashion out the other. I don’t want CO2 gas stored, because any idiot can see that gas will leak out of its container one day. I don’t want CO2 stored in frozen form because any idiot can see we’d have to pay the energy bill for keeping it cold into eternity, or rely on global weather conditions to be stable, which we clearly cannot. So, that’s what I’d like to see. A big power station working with CCS and with all of the thermodynamic processes safely reversed and all the energy fully recaptured. I’d ask Dr Who to create it for me. He’d say much easier to go back in time and not burn it. I am not Shell-shocked that the author seems a little resistant to the awkward idea of leaving some fossil fuel stock unburned; he prefers the “solution” of course – of CCS – (CCS = consume cake squared) – have your cake and eat it – burn all the fossil and then put the genie back in the bottle (except CCS is largely a convenient abstract idea, rather than a reality, with any real CCS requiring huge amounts of time, research money, energy, resource, running cost, and the huge risk that the CO2 will someday somehow (almost inevitably) leak / leach / seep out again and the whole thing will have been worse than useless. And very expensive in energy terms. Thank you for your well written and informative blog and delighted that you evidently accept IPCC AR5’s carbon budget . However, there are many arguments against your suggestion that Shell’s unburnable the carbon conundrum could be solved by CC&S or massive afforestation . Two of the most obvious ones are that at best, CC&S could only deal with emissions from large fossil fuel point sources leaving the vast majority of sources uncaptured and unstored while land based sinks (currently about 2.6 BTc per annum) would need to be 4x more effective to match even existing annual anthropogenic CO2 sources ( about 10.5 BTc per annum). Have a read of the Shell Mountains scenario which discusses how all this hangs together. I’m also a chemical engineer and now retired after over 30 years in the oil and gas industry. As a chemical engineer you know full well, or should, the energy inefficiency of CCS and the implication of burning through avaiable fossil fuels at twice the rate for the same power output. Hardly considerate of future generations for at best a nebulous benefit. I also notice your dismissive comments regards AW Montford as a “blogger”, I’d suggest you re-consider that assesment, your position as chairman of ITEA does not suggest a neutral balanced position, have your read any of his books with an open mind?